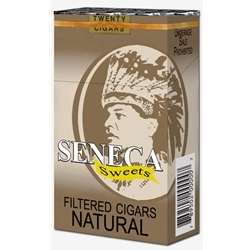 Seneca Filtered Cigars are native-made, uniquely wrapped with an all-natural “sweet” tobacco leaf. Each of these discount filtered cigars are infused with a unique high-quality blend of tobacco that allows for a slow elegant burn sending off rich full-bodied flavors and aromas making Seneca Filtered Cigars a superb and satisfying smoke. Sophisticated and well-loved by loyal fans, Seneca Filtered Cigars continues to be a mainstay brand in the premium little cigar smoking world. Seneca Filtered Cigars are distributed nationwide by the Seneca Nations, NY. Each of these discount filtered cigars are available at our online tobacco store in various unique styles to choose from. Cherry, Grape, Light, Menthol, Natural, and Vanilla. Here at Smokers Discounts we believe Seneca Filtered Cigars can be the right choice for your smoking needs. Sit back, relax and enjoy a great quality smoke at an inexpensive price. Our online cigar store was created to make it easy and affordable to buy filtered cigars online. Call us for more details!